Cameron is not a brave boy… that is to say, he’s easily frightened by a lot of things including heights, the dark, people he doesn’t know, houses he’s never been too… I wouldn’t say he’s a coward exactly, more so that he’s very cautious. My boys went to school, my wife brought their costumes a little later for when all of the students were to get dressed up. They had a great time, everyone looked great and had fun. Then, when they got home, Tyler (3) felt very sick and went to bed. He is Cameron’s little brother. He slept for hours and woke up with a fever. The decision was made that I would take Cameron out and my wife would stay home with Tyler. We drive to my inlaw’s place because they are in a nicer neighborhood and my wife’s mom likes to go out with us and see all the children… while on the drive, I asked Cameron if he was sad that Tyler had to miss out on Halloween. I told him that I was sad because he’s 3, this is very important to Tyler.. getting lots of candy, having lots of fun… and for mom too because she has to miss out too. So now that we had a mission, I told Cameron that what he’s going to have to do, after he says “Trick or Treat!” is to also tell the person that his little brother is home sick and ask if we can have a candy for him too. This excited Cameron quite a bit, and not in the “ya, extra candy!” kind of way that I expected either. He genuinely wanted to get candy for Tyler. So we go out and Cameron absolutely refuses to knock on the door. 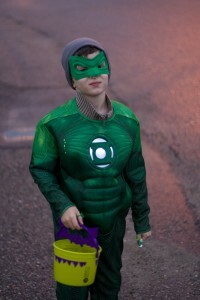 So I do, and after prompting, he says “Trick or Treat” really quietly… and doesn’t utter a word otherwise. I mention to the lady that Cameron has 2 buckets for candy because his little brother is home sick and Cameron really wants him to have some candy too. He was extremely nervous… this is totally understandable and I don’t push him in the slightest. However, over the course of the next few houses, I let him know that he’s going to have to knock on the door soon. Finally, a house with no steps, no entry way that’s narrow… he feels ok about it and with me beside him, he knocks… very quietly. But this was the beginning of a very successful night because from then on, he would knock on every door. And from then on out, it was his line at every house… sometimes a little louder, sometimes not… but he’d tell the person. Cameron was so very excited to fill up Tyler’s bucket and even more excited when it was a particular candy that he just knew that Tyler would like. Sure enough, most everything in there had doubles.. even the very thoughtful person that put a paper cup with a packet of hot chocolate in it for after the trick or treating.. there was two. So in the end, I can say without a doubt that my son is extremely cautious and will likely shy away from a lot of things but he is most definitely, absolutely not a coward.